I found this recipe on Recipe By Photo on Pinterest and tried it out last night with Tim. Delicious. A bit time consuming and messy, but worth the end result. They didn’t really give amounts, which of course I don’t do either. I just got a bunch of bananas (7ish), let them get brown, cut them up and froze them. Then I put about half in my mini food processor (it says you can use a powerful blender, but my blender is a piece. Good thing I opted for the food processor) and turned it on. And wiped the bananas down the side to the blade. And turned it on. And wiped the bananas down the side to the blade. Over and over and over again. At first, it had the consistency of like Dippin Dots. I added the peanut butter before the bananas were fully chopped (you were supposed to wait) so that it would get creamy faster. Totally worked! 😀 Blend blend blend, ready. 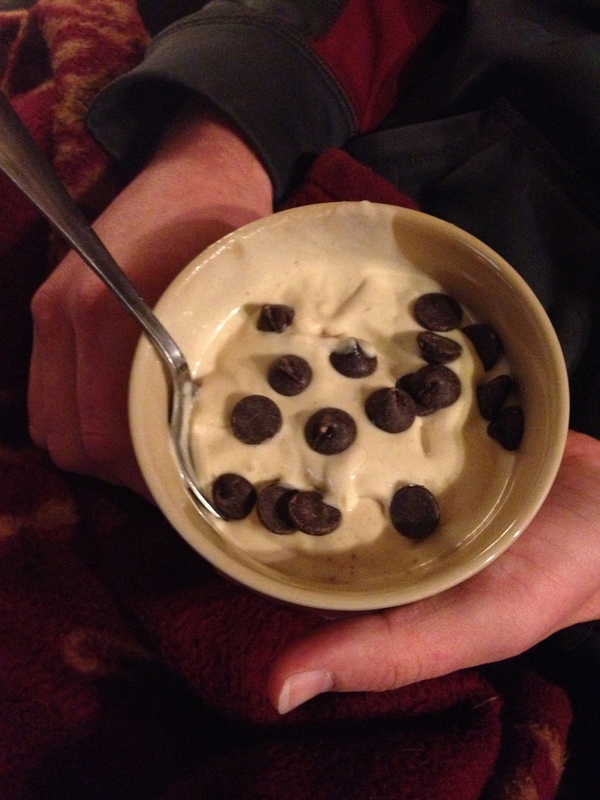 Topped with dark chocolate chips, and serve. Delicious! Go easy on the peanut butter. I thought it had an overwhelming peanut butter flavor (I used two tablespoons-ish.) Tim thought it was fine. I think next time I might do Banana-coconut… ??? What can I put in there that’s like peanut butter but not… we’ll see. I have faithfully resisted them. 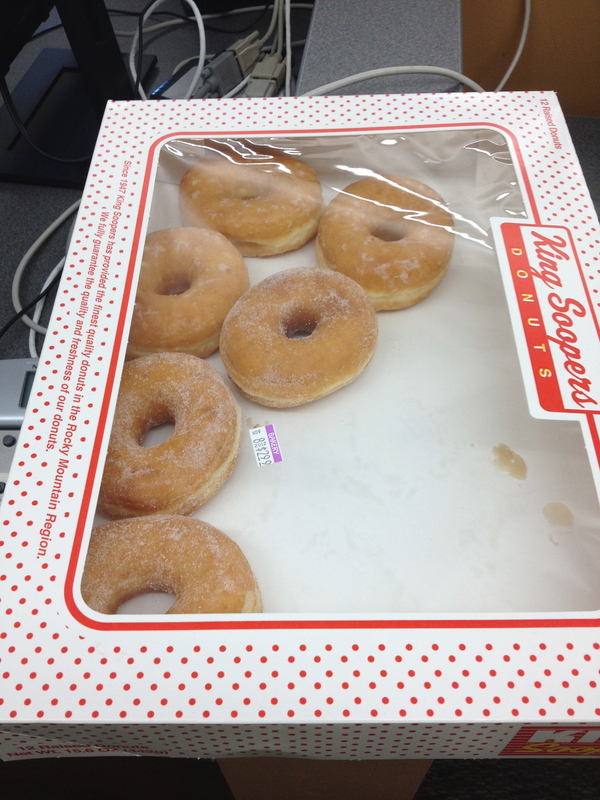 Even though I love how they melt in my mouth… starting out all puffy and smushing down to a bite of doughy deliciousness… Sugared are good… the ones on my desk with the caramel topping are my favorite, though that strawberry looks pretty good… And coconut. OMG. I love coconut donuts. And chocolate. Sometimes the chocolate is better than the caramel. I digress. Not today. 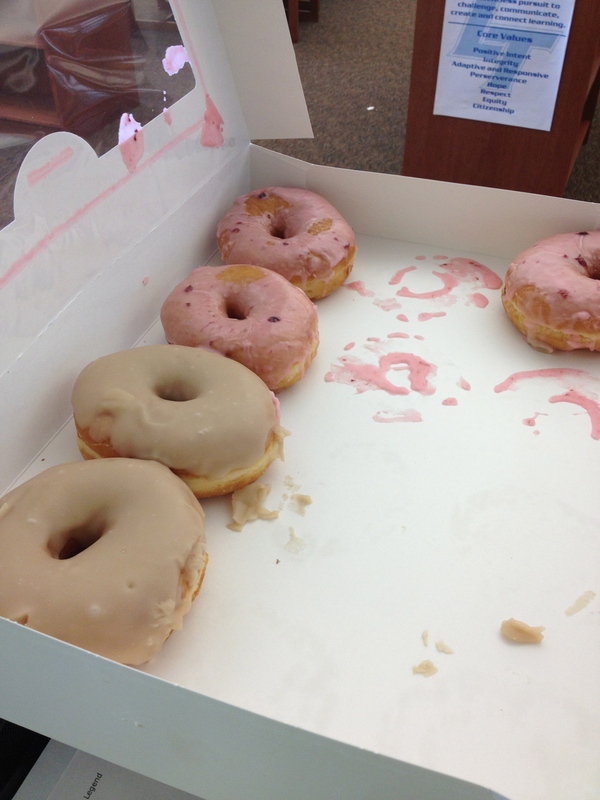 No donuts. Just Say No!